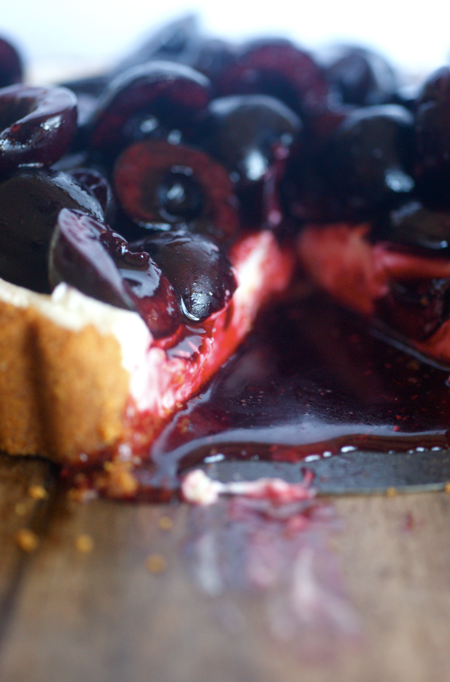 This is a stunner of a tart. It's a bit like unbaked cheesecake, which probably explains why I like it so much. Still, I promise this is different from my Cherry Cheesecake. It's darker, richer and spicier. In a lot of ways, I suppose this is quite a dark and sinister dessert. Your hands get stained blood-red when you pit and halve the cherries. It seems to 'bleed' redcurrant glaze when you cut it. And, of course, there's maSCARpone (this may or may not be the way I remember how to spell it...). Or, you know, my imagination could have been clouded by reading too many of Shakespeare's history plays - blood, back stabbing, child murders etc are getting all too everyday. I'm reading my way through the complete works this summer and have been reading the many, many Henries, the Richards and John in the past days. I'm trying to maintain a rate of two plays and at least a few sonnets per day. It's incredibly enjoyable - I really recommend it if you have the time. Instead of using an apricot jam or similar as a glaze, I decided to go for something different. 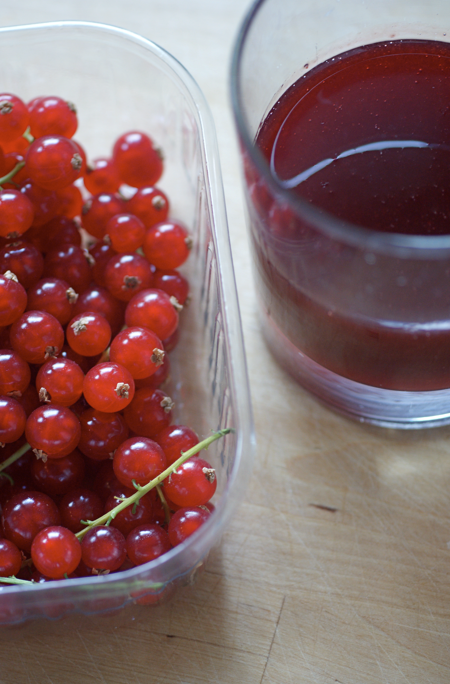 We bought some redcurrants recently but I hadn't really found a use for them, especially as they're quite a sour batch. In the end I made this - a simple syrup to toss the cherries in. It's a subtle addition to the flavours but I was really pleased with it. It's also very nice on its own. This is really quite rich - though it's a small tart it can definitely feed a fair few. Mum and I had a slice each and then she took the rest with her to a barbeque. You really want to eat it within 24 hours so try and find some helpers to eat it with! I got the idea for this from smitten kitchen - Deb did hers with nectarines. 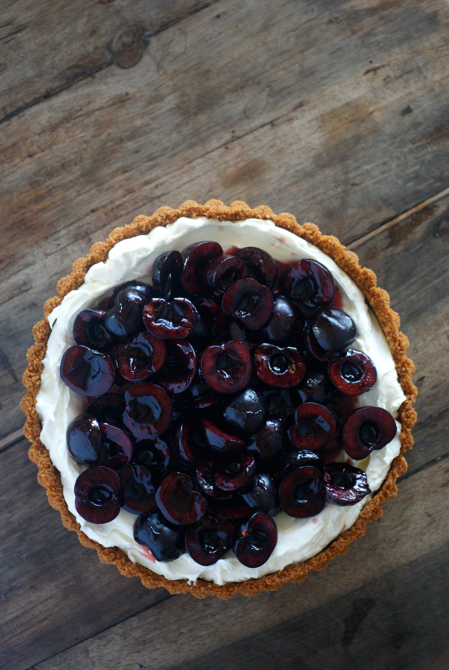 I thought I would be different and do it with cherries, then realised that she had adapted it from using cherries. Not so original after all! I'd like to try it with peaches or the like - it would give it a refreshing edge. 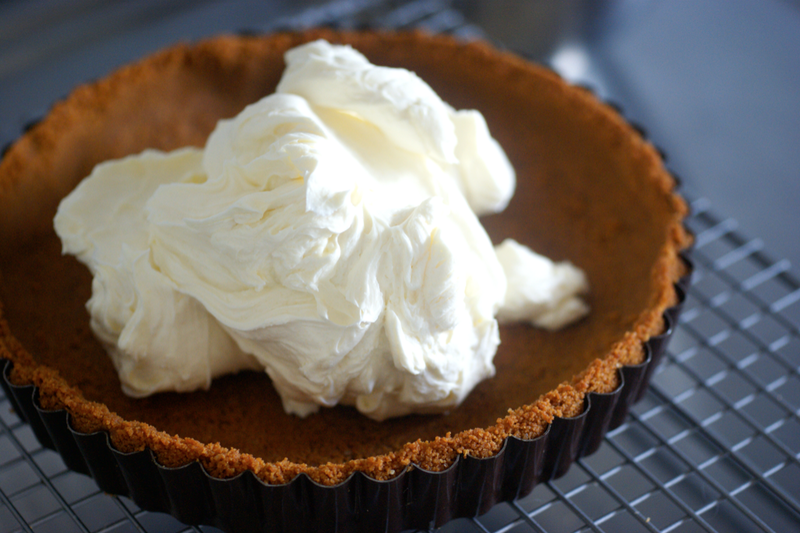 Maybe also fold in some whipped cream to have a lighter version, or some sour cream as Deb does. Preheat the oven to 170C/350F. Break the gingernuts up roughly, then put in a food processor and blend until fine. Melt the butter, then pour into the processor. Blend again until all the crumbs are coated. 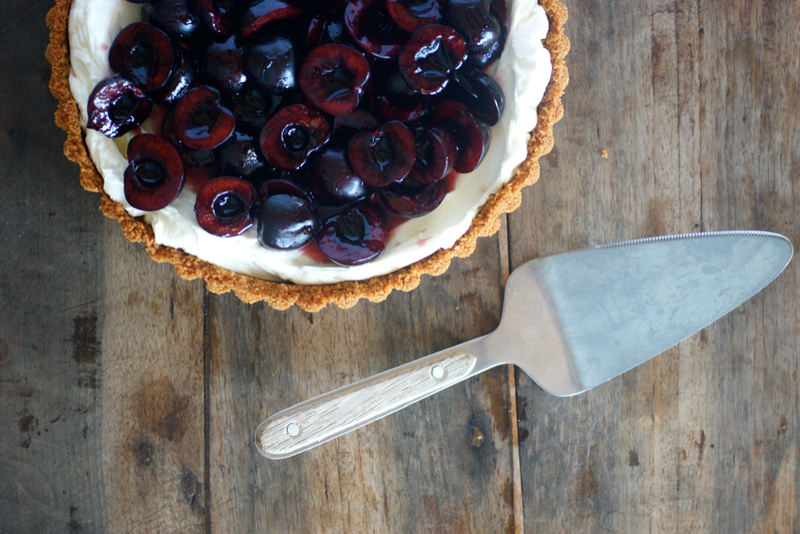 Tip into a 20cm tart tin with removable base. Use a measuring jug or similar to press the crumbs down and into the sides firmly. Place in the oven for about 8 minutes or until slightly darker. Cool on a wire rack. Put all the ingredients into a small saucepan. Heat at a medium temperature for until bubbling, then reduce to low for five minutes or so, slightly squishing the currants. Leave to cool, then pass through a fine sieve. Beat together marscarpone and cream cheese, then beat in the lemon juice and vanilla. Finally beat in the sugar and lemon zest. 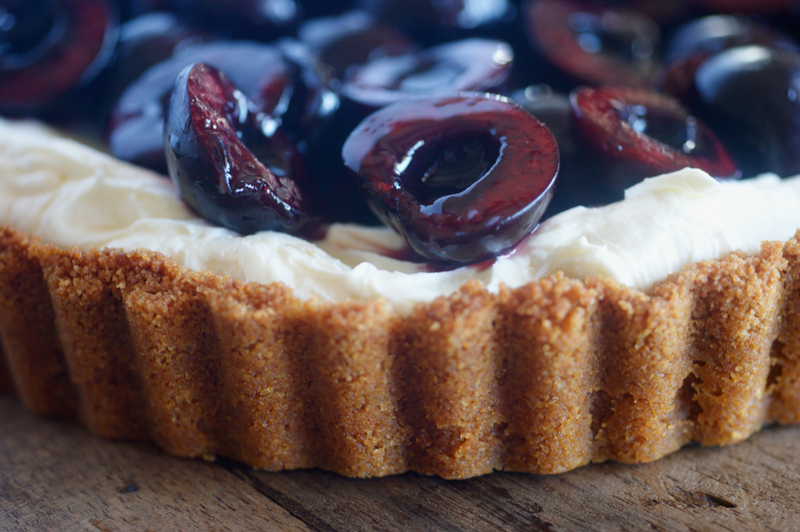 Spread over the cooled base and put in the fridge while you fiddle with the cherries. Pit and halve the cherries. Toss them in a few tbsps of the redcurrant glaze. 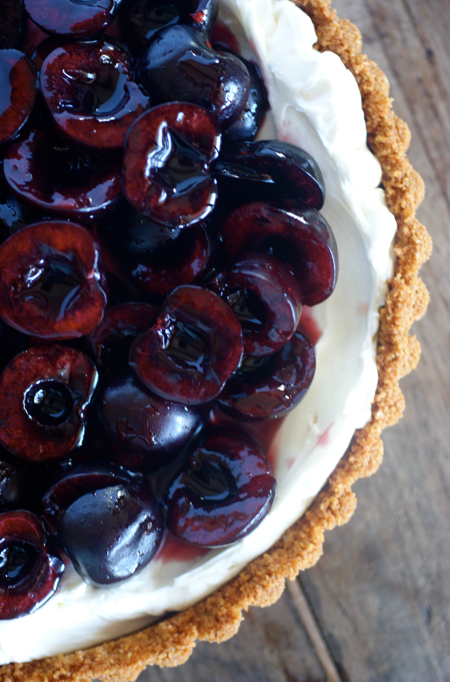 Take the tart out of the fridge and top the filling with the cherries. It tasted wonderful- the crust was particularly delicious! I love the photos of the red currents. They are indeed very red. This looks like a great dessert. Gingernuts make a very good crust too. I wondered when the gongernuts would show up again! Looks a wonderful summertime dessert! Just discovered your blog and I'm lovin' it! 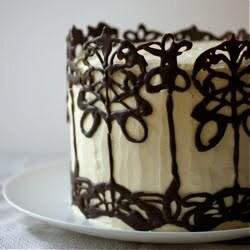 Your photos are making my mouth water!